We get a lot of requests from Calgary homeowners for front walkway ideas and front walkway installations for their landscaping. There are many good options for front walkways and some may be better than others depending on what your landscaping allows. Let’s have a good look at what out there and what may work best for your front yard walkway. Concrete blocks may not be the most attractive material to use for your front walkway but they are likely the least expensive option. Most households have concrete blocks for walkways. You can see them all over Calgary. The concrete blocks are typically 24″ x 30″ and are often installed right onto the dirt, sand or a crushed gravel base. Older homes in Calgary were built with these blocks being used for both front and back walkways. This material may be inexpensive but it is also known to settle, shift and create tripping hazards. We love paving stone patios and walkways if your walkways do not have a lot of steps or if they are not in a high traffic area. Paving stones require stone retainers when they are inset into steps. Inside the stone retainers is crushed gravel, then sand and then the paving stones are inset on top of the sand. This means there are multiple layers to your step whereas with concrete you simply have one poured step. We think one solid, poured step will be a much longer lasting step than one that is built with multiple components. This is especially true if you have a high traffic front walkway. If you only have a few steps in your front walkway or your walkway has not steps then paving stones are a good choice. If you have many steps and a steeper grad, then we would recommend poured concrete like exposed aggregate or stamped concrete. Broomed, exposed or stamped concrete. We like this option of all the front walkway ideas but only if you have several steps in your walkway. If you have a few steps or none at all then paving stones are the most attractive option. In our experience concrete poured walkways with steps last much longer than any of the other options. Concrete walkways are very popular and come in a variety of materials including broomed, exposed aggregate or stamped. Broomed concrete is what you see on city sidewalks. The look is quite plain but it is the least expensive option and therefore makes a good choice for homeowners who are on a strict budget. Keep in mind, the front walkway can make or break your curb appeal and it is one of the first things people see when they visit your home. Exposed aggregate walkways can add curb appeal to your front yard landscaping and you can order the aggregate in several colors but typically most homeowners choose tan or charcoal. Exposed aggregate is more expensive than broomed concrete but looks substantially more attractive. Some homeowners are concerned about the aggregate being hard to shovel but not to worry; it shovels quite well and shouldn’t cause you any issues during winter time. Stamped concrete is a very popular option with homeowners. Stamped concrete is made to look like flagstone or paving stones and the look can be quite stunning if it is installed properly. One concern with the stamped and dyed concrete is that the die can fade after a few years and the color can look unnatural. Concrete walkways all run the risk of cracking. Calgary’s freeze and thaw climate can create heaving and eventually cause your concrete to crack. 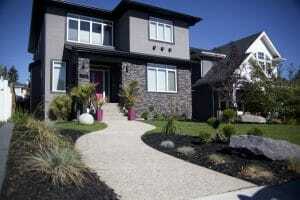 Paving stones are an excellent choice for your front yard landscaping and add beauty and class to any front entrance. There are literally hundreds of paving stone options to choose from and they come in a multitude of colors, shapes, and sizes. Paving stones don’t run the risk of cracking like concrete can and if you do happen to get some settling or heaving in your walkway, the stones can be easily adjusted and re-leveled. Paving stones are the most costly option for front yard walkways but the investment adds value to your property and you can’t beat the curb appeal.